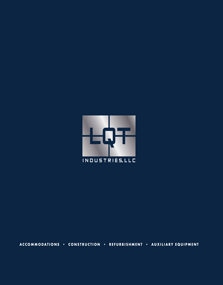 LQT Industries, LLC, located along the Gulf Coast, designs, manufactures, and refurbishes accommodation facilities, specialty buildings, MCC buildings, and Blast Rated buildings. LQT also rents construction equipment for oilfield, emergency response, and remote workforce applications. By striving to provide the highest quality products and services, LQT has become a leader in providing accommodations and equipment for the oil and gas industry worldwide.